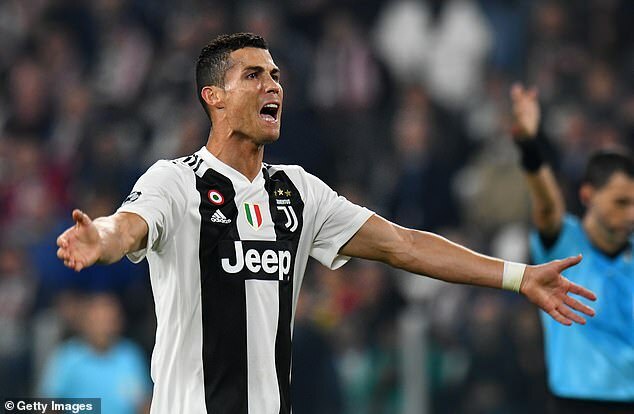 Cristiano Ronaldo has insisted that Juventus should have easily beaten Manchester United by ‘three or four goals’ after his former side produced a late comeback to shock the Italian giants in Turin. Massimiliano Allegri’s men looked to be heading towards another win in the Champions League after Ronaldo’s stunning volley broke the deadlock on Wednesday evening. With five minutes left on the clock, Juan Mata stepped up to scored a fantastic free kick before Alex Sandro put the ball into his own net to give Jose Mourinho’s side a shock victory at the Allianz Stadium. Juventus are still in a comfortable position to qualify for the knockout stages but Ronaldo was critical of the amount of chances Juventus wasted following the 2-1 defeat. Though the forward rued the missed opportunitues, he was happy with his own effort which broke the deadlock in their Group H encounter. The 33-year-old said: ‘I have seen the replay. I didn’t realise it was a fantastic goal but I did good movement and I kicked it strong. Ronaldo also wasn’t impressed with his former club and their tactics, which led to both of their goals late on in the game. ‘Manchester, they didn’t do much in my opinion they created two chances (from) set pieces. The win sees Mourinho’s men move up into second on seven points, while Juventus sit at the top of the Group H table with nine points.